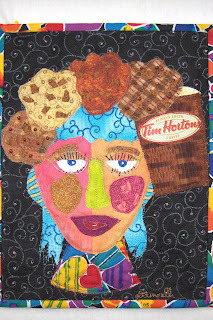 My Self Portrait: You Are What You Eat! Finally have all my Christmas shopping done! My son, Jamie always wants a surprise and that is difficult to do when he is 27 years old. The other day I saw those treats called Kinder Surprise that used to drive me crazy when the boys were young, little toys everywhere. I'm thinking that it would make a great surprise! Last night I was crazily making some fibre art for my friends, Margie and Helene. We meet for breakfast every so often. We all worked at the same school. 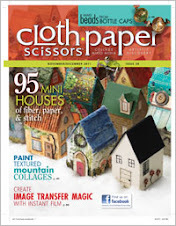 I decided to make the 4x4 blocks from the Quilting Arts Gifts issue. The article is written by Virginia Speigel. They were a lot of fun to make and I was able to use some of my painted fabric. My one friend thought it was a coaster and that makes perfect sense. Frame or use it for your coffee! 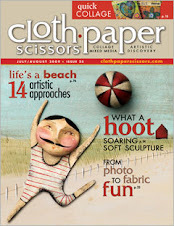 I finished my article for Sue and Terri at Fibre and Stitch and I sent it to both ladies. I am posting a taster of the landscape I created. The article is called Easy Landscape Manipulation. This job was one of my big intentions and now it is completed! Also, I am putting the finishing touches on my challenge piece for Dale Rollerson, soon I can post it to down under along with the 4x4 challenge I am doing with Cloth Paper Studio and a couple of pieces of embellishing I am thinking of sending to Sew Sommerset for the next issue. This is the second Christmas without my dad. This is my favourite photo that I took in Savannah Georgia in 2006. Notice the name of the restaurant!!! I am not so sad now but I miss him like crazy. I know Oskar is keeping him company where ever they are! Donna - what a lovely self portrait! I have to make one of these. I read your comment about your dad. I too, am celebrating the second Christmas without my dad. I miss him too. I hope you have a very Merry Christmas!